Ripple’s Effect jumped to the number 3 spot in the Amazon Children’s section on Saturday, May 17th. It’s written by popular happiness researcher, author and speaker Shawn Achor and his sister, Amy Blankson. Shawn has been featured recently on Oprah’s Super Soul Sunday sharing his research on the secrets of happiness. He joins us today to tell us how he’s sharing those secrets with children through Ripple’s Effect. First, let’s find out what your book is about. Ripple’s Effect is a delightful tale about a dolphin who teaches a shark to smile, and in the process, learns that happiness is a choice. Through this story, residents of an aquarium learn that sometimes a smile is all it takes to make a world of difference. I wrote this book with my sister, Amy Blankson, as a way to bring positive psychology principles to children. The book fights the common held belief that it takes big actions to make big changes. 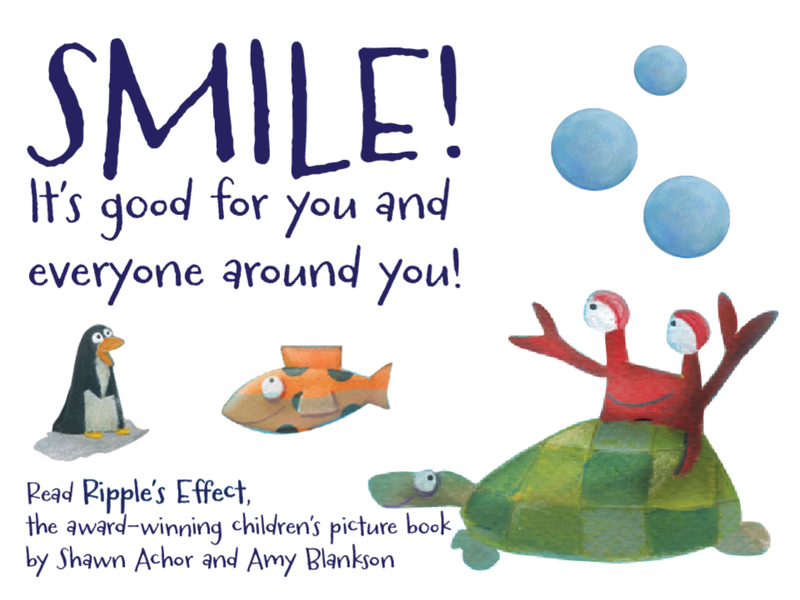 Ripple’s Effect can also be read in an anti-bullying light, as it emphasizes that we can smile in the face of a bully…and hopefully create happiness outside of ourselves.You can watch a book trailer HERE. (Scroll down past the author photos.) Tell us about your path to publication: Traditional or independent? Amy and I wanted to write this book to share our company’s message with children, parents and teachers. We researched publishers and found a wonderful fit in Little Pickle Press, with their selection of mindful children’s titles and eco-friendly printing practices.How are people finding out about your book? Tell us about your marketing and use of social media. We are thrilled to watch the success that Ripple’s Effect has had in spreading the message across the world. In my day to day work, I speak to large corporate audiences about the power of The Happiness Advantageand every time, I get asked how to brings these principles and ideas home to their children and families. Our publisher Little Pickle Press also created a free curriculum for teachers to utilize the Ripple’s Effect in their classrooms.Some studies say children reading e-books are reading more, while other studies say they comprehend less of what they read. What’s your opinion or experience? My previous book (for adults) The Happiness Advantage was published in eBook form, so when the publisher suggested an ebook format for this book, it made complete sense. Seeing the colorful drawings come alive on a digital screen and hearing my sister’s voice read the story aloud has been fun to watch as well! In the studies I’ve read, reading comprehension is best reinforced with thoughtful questions and discussion of a story. I believe that this can happen with either e-books or hard copies, but e-books often require more intentionality on the part of the parent as the child holds the reading device and the parent may not always be watching the screen to know what they are reading. As an uncle at the time, and now as a parent, I believe we wrote Ripple’s Effect in a manner that is conducive to family or classroom discussion about positivity and happiness, and we encourage all parents and teachers to use the discussion questions at the end of the book to continue the conversation. We wrote this book for children ages 4-8 as an introduction to principles of positive psychology. Our goal was to empower young people to make a choice about how they interact with the world around them. At one author’s reading, a child announced to me proudly, “I was born mean!” My heart dropped because this five-year old child believed that about himself and had received some kind of reinforcement that that behavior was good…that it made him tougher or cooler. I chatted with him for a while after the reading and thoroughly enjoyed watching him transition to not only to smiling but to brainstorming ways to make others smile and giving me a fist bump. Children are so impressionable and it doesn’t take much to turn their world around and inspire them for years to come. It is our hope that our book will do that for children around the world. I just published my second business title, Before Happiness and continue to work as a speaker and happiness researcher, although I’ve prioritized my latest job of being a new dad. Our team has lots of ideas for additional childrens’ books that bring positive psychology principles to children, so we hope the ePublishing world continues to grow and support books with unique messages like ours. Learn more about Shawn and Amy by following them on Facebook. Here are the links: Shawn’s Facebook and Amy’s Facebook. Find out more about their work in the field of happiness at their website. See the latest Kids’ EBook Bestseller List for more top ten e-format authors and their books. It’s usually updated every Saturday morning. This week I’ve updated it on Friday evening, since I’m heading out early on Saturday for a writers’ conference.